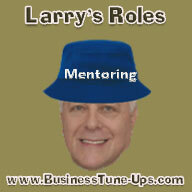 a CAR tuneup and a BUSINESS tune-up - ie. fixing, repairing a business? 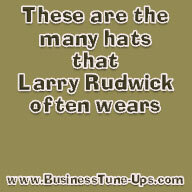 Larry Rudwick, a.k.a "Larry The Tune-Up Guy", having done automobile tune ups in college, now is an experienced business coach. 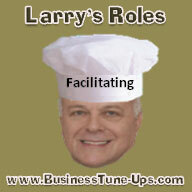 He explains the business analogies between doing a car tune-up and a business tune-up. "Businesses and motor vehicles are BOTH complex systems." CARS have many moving parts, complicated electronics and must work in varying environments and conditions. Good car mechanics have years of training and use sophisticated equipment to diagnose a multitude of problems in many makes and models of automobiles. BUSINESSES primarily involve people, who must relate with other people, to produce different products and services through various methods. Businesses have to operate in varying environments, too. Good executive coaches must work well with many individuals, in unique work environments, which makes each business tuneup different in scope and focus. Businesses and people are more complex than cars, usually :) . 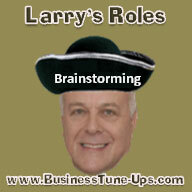 I hope you find the following business analogies interesting and educational! Please note: I'm defining a car tuneup as anything to improve a car's performance, not just simple routine oil changes and spark plug replacements, etc. • Your Knowledge and trusted advisor is important for a good outcome. CARS: If you are a typical car owner, your knowledge of modern automobiles is limited; it is best to have a trusted person you can call on for advice when faced with a potentially expensive car tuneup. BUSINESSES: If you are a typical business executive, you probably have a lot of experience in your specific field, but have a significant number of areas that are not your real strengths. This often correlates with what areas of business to concentrate on. A trusted advisor can be a big help here, too. • Problems, Needs and Desires: People work on their cars and businesses for some of the same reasons! CARS: Are you experiencing specific problems with your car, or is it just "time" to get a tuneup? Are you satisfied with the regular performance of your car, or do you want some modifications that will "soup it up" - improve its performance in certain ways? Is your car mostly a workhorse or mostly a status symbol? BUSINESSES: Are you having problems that you don't seem to be able to improve on your own? 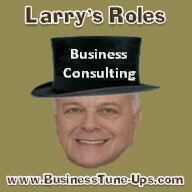 Do you want your business to perform better: easier to manage, greater income/profits, etc.? Are you in your line of work mostly for the monetary rewards or other benefits? The answers to these questions will help determine what kind of business tune-up you may need and want. • Choose the right "Mechanic" for you: Who you pick will help determine the quality and value of the work, as well as what you will learn - it's a very important step. CARS: You will likely rely on a good recommendation from a trusted friend or rating organization. Your conversations should make you feel good about the mechanic's integrity, honesty and knowledge, particularly when they explain what your car needs. BUSINESSES: Good recommendations can also be helpful. But since businesses ARE more complex than cars, and because you will be working more closely with your coach, it is essential that you have good, open conversations and feel very comfortable with your selection. If your coach has personally gone through similar challenges and has complementary strengths, this may be another plus. CARS: When you bring your car in to get checked out, the mechanic "runs diagnostics" on your car's electronics and does inspections (visual, audible and "by feel"), of mechanical systems and individual components. 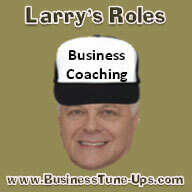 BUSINESSES: Your coach may initially do a variety of "assessments". These analyze the strengths and challenges that your organization and its individuals appear to be working with and/or around. These assessments will lead to an estimate of recommended work. • The "Estimate" is an itemized list with detailed costs. CARS: If the list is long, your mechanic should tell you what work is most critical and what can potentially wait until later. Ask whether there are any possible risks or additional costs if you choose to wait. BUSINESSES: Your coach/consultant should provide you a proposal of what is suggested to work on first, and what projects are likely to follow. You should be able to estimate a return on this investment. If you are not sure how, you should feel comfortable asking your coach about ROI. • Your Decision: What are you going to do? It's time to make a decision. CARS: If the estimate for the car tuneup is reasonable and you feel good about the mechanic, you'll probably say: "Go ahead and do the work." But if the estimate seems high, it's over your budget, or you're just not sure about the mechanic, you've got a more difficult decision. You might look for another mechanic, do a small part of the work, or both. BUSINESSES: Once again, if the quote seems reasonable and you are comfortable with the coach, you'll probably say OK. If you are comfortable with the coach, but the job seems too big, you should discuss your specific concerns and see how well they are addressed. If it is over your budget, ask your coach what appropriate work could be done within your budget. CARS: Some people choose to alter their cars to achieve higher performance than you'd get with a standard car tuneup. This usually requires replacing certain original parts with high-performance parts. Sometimes changing tires will require you to also change the wheels and modify the wheel wells to allow for a bigger size. This will affect performance: steering responsiveness, the ride (firmer or softer), and the traction on-road and off-road. Sometimes fuel system modifications will allow the engine to turn faster and produce more power. Other modifications may increase the fuel efficiency more than a car tuneup. Cosmetic changes may make the owner extra proud to be seen in it. BUSINESSES: There are almost an infinite number of ways to modify a business to achieve better performance such as: Sales and Profits! One of the best ways is usually to invest more in your staff: give them additional training, spend quality time and make them feel and be more a part of your team. Other upgrades could include faster computers with better software - the list can go on and on! Make sure you think about the potentials risks and rewards, the ROI and the cash-flow implications. • Conclusions: Don't "act in haste, and repent in leisure", but do make good thought-out decisions. The outcome can be very rewarding. Cosmetic changes such as new logos, fresh carpeting, etc. can make a big difference, too. But just remember, giving your car a fancy paint job could be a bad investment if it has some big problems and really needs more than a car tuneup. The same general principles apply to business. A good "business mechanic"/coach will help you see these things more clearly! I hope you've enjoyed this car tuneup analogy. 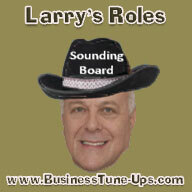 Do you have a questions for "Larry The Tuneup Guy"?